Sometimes when you’re watching a classic film, you see a face pop up in a minor or supporting role that makes you scratch your head and think, “I know I’ve seen him/her somewhere before …” This is inevitably followed by a trip to the TCM movie database to determine just who that random player may be, and a subsequent slap to the forehead when you finally place them. I had a similar moment yesterday. TCM was on in the background while I was working, and I looked up at the screen when a familiar voice tugged at me during a showing of Another Thin Man (1939). I knew that face–I just couldn’t place it to save my life. A quick Internet search later, and there followed the aforementioned slap. Recognize her? I’m ashamed to admit that I didn’t, at first, despite the fact that she has an important role in one of my favorite films of all time. 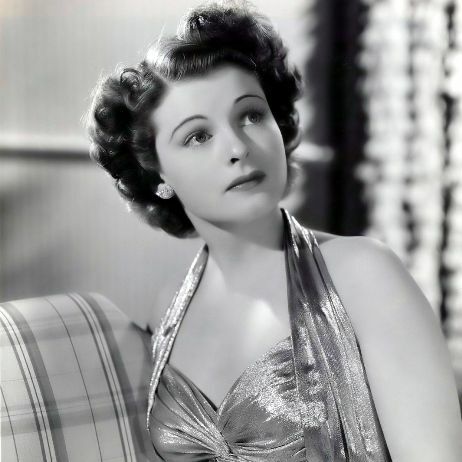 Best known for that Oscar-nominated role, in 1940’s The Philadelphia Story, actress Ruth Hussey had a long career as a supporting star in some great films of the 1930s and 40s. Like many of her contemporaries, Hussey got her start in modeling, first in New York and later on the West Coast. Hussey first appeared on screen in the late 1930s, making her mark in small parts in films such as Madame X (1937), Judge Hardy’s Children (1938), The Women (1939) and the previously-referenced Another Thin Man (1939), the third film in the long-running series. But 1940 finally pushed Hussey into the spotlight. Her turn as Elizabeth Imbrie, the pragmatic photographer harboring a secret love for colleague Macaulay Connor (James Stewart), is a once-in-a-lifetime kind of role. Sharp-tongued Liz serves as a filter for the audience–her commentary, delivered in snappy asides and witty one-liners, reflects viewers’ own opinions of the “idle rich” Lords and their brethren. A bright spot in an already luminous film, Hussey demonstrates a heretofore-unseen comic timing that rivals that of co-star Katharine Hepburn, and delivers a performance that would mark the highlight of her somewhat brief career. 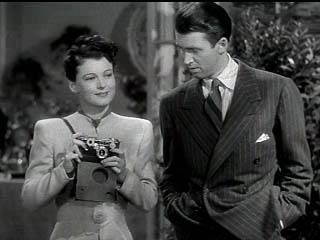 In the wake of Story, Hussey appeared in supporting roles in high-profile films such as 1941’s H.M. Pulham, Esq. with Robert Young and Hedy Lamarr; the 1944 ghost tale The Uninvited, in which she plays Ray Milland’s sister; and the earliest surviving film version of F. Scott Fitzgerald’s The Great Gatsby (1949), in which Hussey played Jordan Baker. Her last major film role was in 1960’s The Facts of Life opposite Bob Hope and Lucille Ball. Afterward, Hussey largely retired from acting, save a few appearances on television through the 1970s. Incidentally, Hussey was not the only Oscar bait in her family–her son, John Longenecker, is a producer and cinematographer whose short-subject film The Resurrection of Bronco Billy won an Oscar in 1970. Hussey passed away in 2005 at the age of 93. At the time of her death, she was the last surviving main cast member of Story, the indelible classic that had forever altered her career. ← Oh, I Just Love Happy Endings! I love it when that happens, because usually for me it’s, “Wait, is that that person who played that tiny bit part in this other movie?” and then I look it up and I’M RIGHT and I get to give myself a big pat on the back. I really like this new feature! Looking forward to more! Great post. I love it when people post about the underrated performers of yesteryear and Ruth Hussey is very underrated. I loved her in Philadelphia Story and The Uninvited. Thank you for your kind remarks about my mother. She was a wonderful actress, receiving fan mail and requests for autographs from all over the world until she died at 93. She was gracious, considerate and accepting, full of great stories and laughter. Her family misses her every day.